Ted Mahsun: When Books Need Policies. I was alerted by Sharon's post about the Culture, Arts and Heritage Minister Datuk Seri Dr Rais Yatim planning to submit a proposal to revise the National Book Policy yesterday, and two questions immediately came to mind. 1) We have a National Book Policy? 2) What does the National Book Policy say about books anyway? books published in this country achieve a high standard both in content as well as in its physical form. I can't imagine what sort of optimism the drafters of this policy were choking on back in '85, but the effects couldn't have lasted long. 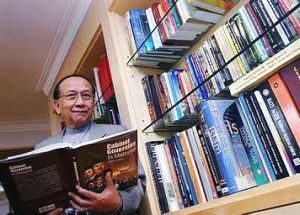 As we all know, the recent survey found that us Malaysians only read a whopping 2 books per year. So much for the third item in the National Book Policy. So now, after having spent millions on library roofs, the government wants to put its foot down and get serious. They're taking out their fingers and pointing it at everyone they can point it at. "The previous book policy," Rais Yatim says, "had not succeeded because there had been no concerted effort by booksellers to promote local books." And not because the government didn't really do anything about it themselves and we don't want to blame ourselves because we're politicians and we hate taking the blame like REAL MEN, he failed to add. "Publishers can find creative methods of branding, positioning and marketing books at affordable prices to significantly encourage the reading habit," Deputy Prime Minister Datuk Seri Najib Tun Razak said. "Ouch," MPH CEO Datuk Ng Tieh Chuan probably said to himself. And by right he should. Because not only does MPH promote local books by staging readings, meet-the-author events and talks, they're very willing to promote a local author by placing their books in prominent places in their outlets. The other bookstores aren't lax in promoting local authors either. I've seen local books - ones in Malay no less - being displayed prominently in Popular, Borders and Kinokuniya. Sure, some of the bookstores need a little push now and then, and certainly things can be improved, but blaming the failure of the policy wholly on booksellers seems a little harsh to me. Most Malaysian readers - those who definitely read more than two books per year - when asked to comment about the new revision to the policy said, "What's the difference? It's going to mostly benefit people who read Malay books and those books are already cheap anyway." Others said, "the new tax incentive sounds cool. Now if I only brought home an above-RM2500 salary to take advantage of it." Whatever. Go build a new library roof, Dr. Rais Yatim. I too wonder sometimes if these guys have their heads in the clouds. Do they actually go to bookstores to see what's out there? And as for MPH not promoting local authors, hello? What was Aug dedicated to? i think poor datuk ng has been saying "ouch" an awful lot lately. I really feel for the booksellers. I think they've been doing a wonderful job promoting reading - it is their bread and butter after all - and then some minister comes along and says they're not doing a good enough job! There is one sure fire way to get people reading. In fact, I reckon it has a 80%-90% success rate. Do this, and every child exposed will be an adult reader, and they will read more than 2 books a year. I guarantee it. An adult has to sit down with the preschool child(ren) once a day, preferably at a set time, and read to them for about half an hour. Exciting, colourful kids' books in a friendly atmosphere. On a regular basis. Starting at the latest by 12 months old, and preferably even younger. There are a couple of problems. The adult has to be a good reader, making the book sound entertaining. And they have to have access to a number of good books. They wouldn't have to buy them - just get them from the library round the corner...(scuse me while I fall about laughing on that one). For a population of say, PJ, there should be at least 10 large free public libraries offering books in different languages. Primary schools and kindergartens can help, but it really takes a home environment for best results. Well said, Glenda. Of course there's that sticky problem of having adults actually reading to themselves first, nevermind reading to their kids. And welcome to the blog! Nice of you to drop by! spot on glenda! and parents have to learn the skill, ted, you're right. i have a teacher-training friend who runs workshops for parents and their kids together. this is what is needed to break the cycle.